Born Feb 4 18601,10,11,12,13,14 [Feb 4 185915], Iowa1,10,11,12,13,14 [Kansas10,15]. He married Laura Rachel Bower10,16 [Mary Rachel Bower2], Feb 20 188410,16 [about 18831], Crawford County, Kansas10,16. 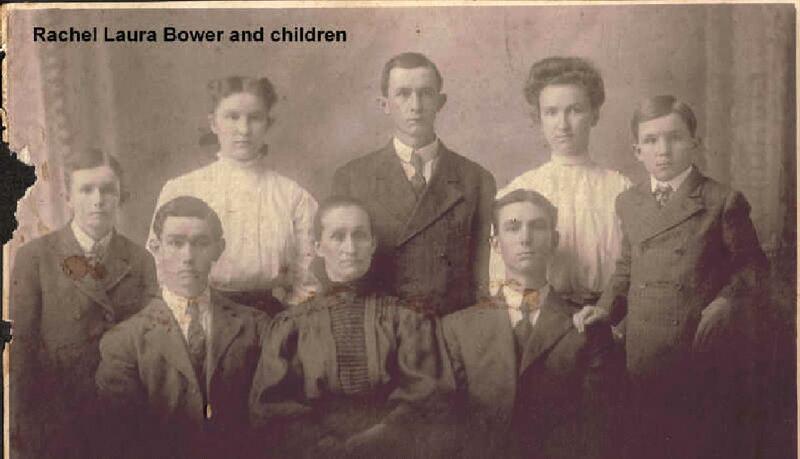 Laura, daughter of Hyland Derry Bower & Mary Elizabeth Wolf1,2, was born Sep 11 18621,2 [Sep 11 186316], Greene County, Ohio1,2 [Indiana3]. Hanshaw, Joseph V., head-of-household, age 40, born Feb 1860 in Iowa; parents born in Ohio; married 17 years; occupation: farmer; owned farm (mortgaged). Hanshaw, Laura R., wife, age 37, born Sept 1862 in Ohio; father born in Maryland; mother born in Ohio; married 17 years; 7 children, 7 living. Hanshaw, Gertie A., daughter, age 15, born Oct 1884 in Kansas; father born in Iowa; mother born in Ohio; attended school 8 months. Hanshaw, Joseph E., son, age 13, born Sept 1886 in Kansas; father born in Iowa; mother born in Ohio; attended school 8 months. Hanshaw, Emett [unclear], son, age 12, born Apr 1888 in Kansas; father born in Iowa; mother born in Ohio; attended school 9 months. Hanshaw, Freddie R., son, age 10, born June 1889 in Kansas; father born in Iowa; mother born in Ohio; attended school 9 months. Hanshaw, Flossie L., daughter, age 9, born Jan 1891 in Kansas; father born in Iowa; mother born in Ohio; attended school 9 months. Hanshaw, Charles E., son, age 6, born Oct 1893 in Kansas; father born in Iowa; mother born in Ohio; attended school 9 months. Hanshaw, Regnald V., son, age 4, born Dec 1895 in Kansas; father born in Iowa; mother born in Ohio. Peterson, Gussie J., nephew, age 5, born Feb 1895 in Kansas; father born in Sweden; mother born in Indiana. Peterson, Highland C., nephew, age 2, born July 1897 in Kansas; father born in Sweden; mother born in Indiana. Joseph Valentine Hanshaw died Aug 8 190418 [May 8 190410,15], Girard, Crawford County, Kansas18; age 4418. Hanshaw, Laura R., head-of-household, age 47, born in Indiana; father born in Maryland; mother born in Ohio; widow; 7 children, 7 living; occupation: farmer; owned farm. Hanshaw, Gertie A., daughter, age 25, born in Kansas; father born in Iowa; mother born in Indiana; occupation: school teacher. 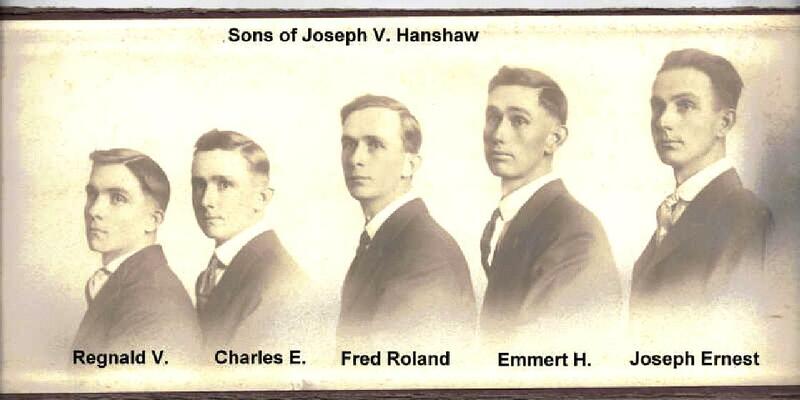 Hanshaw, Joseph E., son, age 23, born in Kansas; father born in Iowa; mother born in Indiana; occupation: farmer, general farm. Hanshaw, Emett H., son, age 22, born in Kansas; father born in Iowa; mother born in Indiana; occupation: farmer, general farm. Hanshaw, Rollin F., son, age 20, born in Kansas; father born in Iowa; mother born in Indiana; occupation: farmer, general farm. Hanshaw, Charles E., son, age 16, born in Kansas; father born in Iowa; mother born in Indiana; occupation: farmer, home farm; attended school. Hanshaw, Regnald V., son, age 14, born in Kansas; father born in Iowa; mother born in Indiana; occupation: farmer, home farm; attended school. 1900 census, Crawford Township, Crawford County, Kansas; roll T623-476, ED 76, page 3A, line #10, dwelling #43, family #43. RootsWeb WorldConnect data by Lou Lauderbaugh (). 1910 census, Crawford Township, Crawford County, Kansas; roll T624-436, ED 79, page 81B, line #54, dwelling #32, family #34. Ancestry Family Tree data "Norton Family Tree" posted by "Snorton51". Kansas, Births and Christenings Index, 1885-1911; http://www.ancestry.com. 1860 census, Village Township, Van Buren County, Iowa; page 256, line #1, dwelling #102, family #103. 1870 census, Village Township, Van Buren County, Iowa; page 397, line #22, dwelling #269, family #259. 1880 census, Crawford Township, Crawford County, Kansas; roll T9-378, ED 54, page 39D, line #9, dwelling #218, family #233. RootsWeb WorldConnect data by Sandy (). 1900 census, Crawford Township, Crawford County, Kansas; roll T623-476, ED 76, page 3A, line #7, dwelling #42, family #42. Kansas, Deaths and Burials, Index, 1885-1930; http://www.ancestry.com. 1910 census, Crawford Township, Crawford County, Kansas; roll T624-436, ED 79, page 81B, line #61, dwelling #33, family #35.